It was a special moment for Benz, a 25-year-old forward with Zurich Lions: she missed the last two seasons with concussion problems, and has only returned to Swiss league action this term. Twenty points in 14 games got her back into the international set-up in time for the Olympics, and after three assists against Korea she relished her decisive double blast in this game – not least because it secured a second victory in the competition. Although the final margin was fairly comfortable here, the Swiss had to hold off a lively Japanese team that had the better of the first period and could have pulled off a surprise victory with greater composure in front of Florence Schelling’s net. But Japan finally got the goal its efforts deserved with 12 minutes to play when the hard-working Kubo became the first player to score on Schelling at this year’s Games. Kubo’s touch looped Mika Hori’s shot beyond the reach of the Swiss goalie, denying her the outright record for shut-outs in Olympic play. Schelling is currently tied with Canada’s three-time gold medallist Kim St-Pierre on four shut-outs apiece. Switzerland’s win means that the Group B picture could be almost wrapped up after tonight’s game between Sweden and Korea. 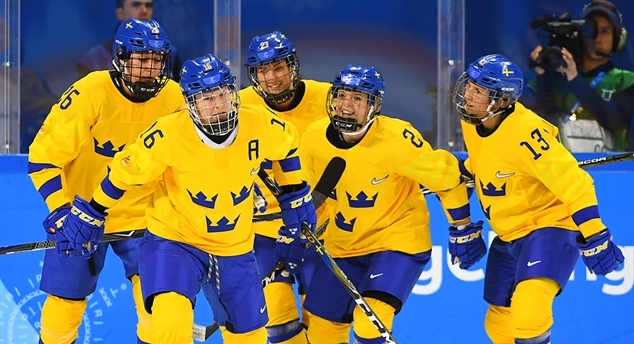 A Swedish victory would ensure that the two European nations will progress to quarter-final match-ups against the teams finishing third and fourth in Group A, while the Asian countries will go directly to the classification round.